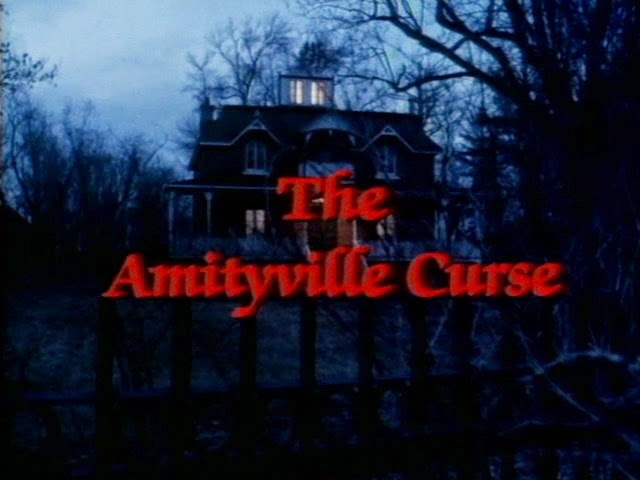 The Amityville Curse does what many a franchise has done & drops the number. I suspect that it wanted to distance itself from the 4th film, The Amityville Horror: The Haunted Lamp. This is the 5th Amityville movie & has the honour of being guaranteed to be at least scarier than the last! As the movie opens we see a house in the background and it’s clearly not 112 Ocean Avenue, the Amityville House. Yep, after the car crash that was the evil escaping into a lamp in the last movie the creators decided to set this movie in a completely different house. It’s completely unrelated to any of the movies that came before only briefly mentioning the towns super-natural past. 1 – They dropped the number presumably out of shame. 2 – It’s a completely different house. 3 – It’s unrelated to any of the movies that came before. So they call it Amityville anyway in the hope of cashing in on the name. Disgraceful. These moments are effective but held together with a bland & boring plot. It’s supposed to be a murder mystery, who killed the priest & why? It just barely makes sense but does pick up nicely in finale as we get a more traditional possession/slasher horror. The acting is adequate, not something that actively detracts from the overall movie. What does take away from the experience is the poor quality leaving dark scenes really difficult to watch. It’s cheaply made with some really bad make-up (in particular the damage done to one persons face at the end). There really isn’t much more to say…it’s a boring movie trying to cash in on a series that had already fallen to incredibly low depths. As a haunted house movie it lacks any decent scares only offering the odd creepy moment.